The last four chapters have been spent looking at the balance sheet and income statement and how to use them. In this chapter, we will move on to arguably the most revealing piece of financial information that a company gives investors – its cash flow statement. When a company’s financial results are talked about in the news you’ll find that a lot of emphasis will be placed on its profits and maybe whether the dividend has been increased. After all, profits are what matters, right? To an extent, this is true. But cash is part of the lifeblood of any business. There have been numerous past examples of companies that seemed to be very profitable but were teetering on the edge of bankruptcy because they couldn’t turn those profits into cash fast enough. That’s why cash flow statements are really useful for investors. They show you where cash comes in and goes out of a company. If you want to really understand a company’s finances then you need to look at its cash flow. In many ways, profit is based on opinions relating to the treatment of costs and revenues. This means that they can be manipulated to make a company look like it is doing better than it really is. Cash flow is much harder to fudge over the long run and that’s why it’s a good idea to know something about it. SharePad will show you the way. If you remember when we talked about profits and the income statement, one of the most important things to understand was how they are calculated. Profits are calculated on the basis of accruals or matching. This means that a company’s revenues and the costs of generating them are matched against other and recorded when a transaction takes place. This does not tell you when cash came in or went out of the business – the flow of cash or cash flow. They usually don’t happen at the same time. Depreciation – this is an expense in the income statement which matches the cost of a tangible fixed asset against the revenues it produces. It reduces the amount of profit a company makes in a year. However, it is not a cash flow. The actual cash flow happened when the company bought the asset being depreciated which could have been a long time ago. Sales on credit – Customers are often given a period of time to pay for the good and services they buy from a company. This sale will usually be booked in the income statement before the cash is received. Purchases on credit – Similarly companies may buy supplies on credit. These will be expensed in the income statement sometimes before the bill has been paid. Also, companies can pay for supplies in advance (a prepayment) which means that cash has flowed out of the company before the costs of supplies has been expensed in the income statement. The bottom line for companies and investors is that cash matters. It is needed to pay things like bills, wages, interest on borrowings and dividends to shareholders. Investors can use it to spot aggressive accounting by comparing profits with cash flows over a period of time. It therefore pays to spend some time looking at a company’s cash flows. 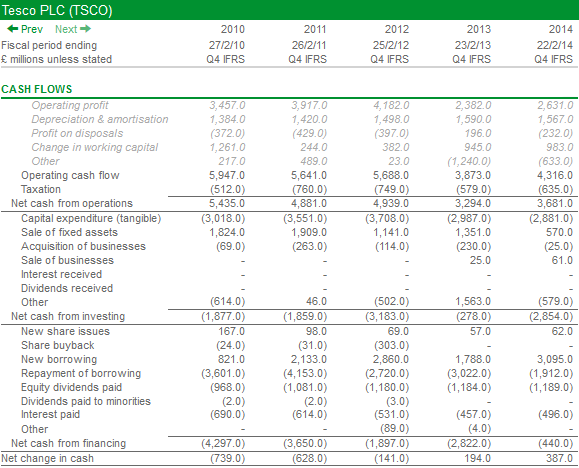 Tesco’s cash flow statement taken from SharePad is shown below. It shows the company’s cash flows for the last five years. 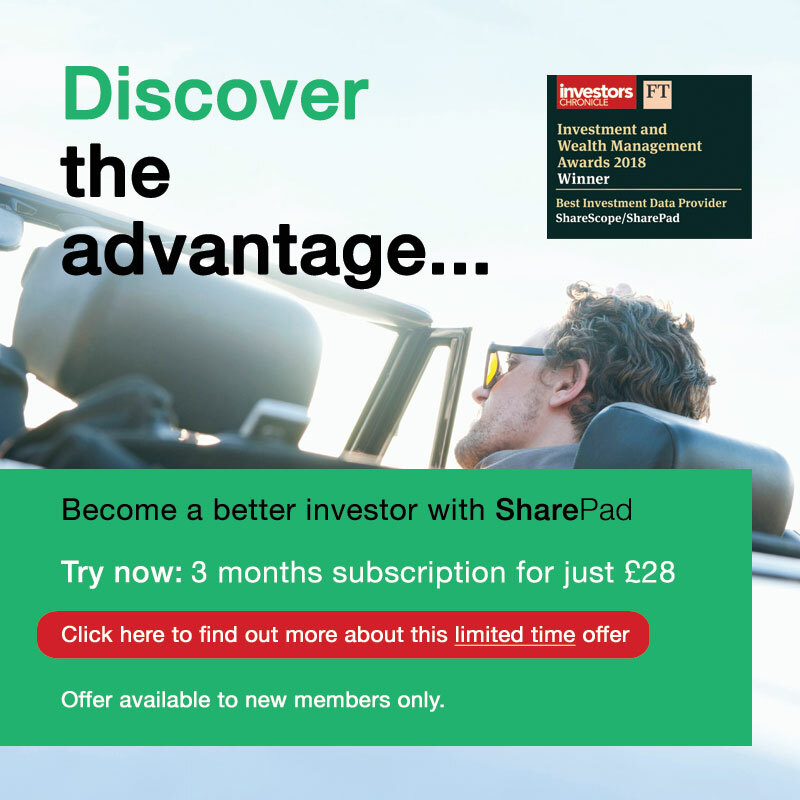 If you wanted to do a study of its cash flows over a longer period of time then SharePad will allow you to go back as far as 1991. You may not want to do this with Tesco, but for some companies this can be a very useful thing to do. For example, you might want to learn more about how a company’s cash flow behaved during an economic boom or a recession. Tesco’s cash flow statement in SharePad is disclosed in a format that is typical for all UK companies. US company cash flow statements are put together in a very slightly different way. I’ll show you one at the end of the chapter. They contain broadly the same information as UK cash flow statements and can be used in the same way. Net cash from operations – This shows how operating (or trading) profit is turned into operating cash flow. Net cash from investing – this looks at the cash flows from buying and selling assets, buying and selling businesses and any interest and dividends received. Net cash from financing – this looks at how a company raises money such as new share issues or new borrowings. It also looks at money spent on paying back loans or repurchasing shares as well as paying for the cost of loans (interest) and shareholder finance (dividends). These three sources of cash flow are then added together to calculate the change in a company’s cash balance over the year. Let’s look at each of them separately. Here we see how Tesco converts its operating profit into operating cash flow. What happens is that any expense – such as depreciation – which reduced operating profit but did not see cash flow out of the business is added to the operating profit number. Any income that did not cause cash to come into the business is taken away from operating profit. Increases in sales made on credit (change in debtors) – take away. That’s a fairly long list, but hopefully after you’ve looked at a few cash flow statements you will be able to understand how a company is – or isn’t – generating its cash. How does Tesco’s operating cash flow stack up? We’ll talk about analysing cash flow statements in more detail in the next chapter. But first, let’s look at the make-up of Tesco’s operating cash flow in SharePad for 2014. The first thing to notice is the large figure for depreciation and amortisation that is added back. This is a big source of cash flow for a company like Tesco which owns lots of tangible fixed assets such as supermarket buildings and fixtures and fittings. It has made profits on the disposal of assets of £232m which was included in operating profit. This has not caused cash to flow into the business from trading (buying and selling things) and has therefore been taken away. The cash flow from selling the asset will be included in the investing cash flow section. £983 million has flowed into the business from changes in working capital. If you want to find out why then you can go to Tesco’s annual report and see. What’s significant though is this management of stocks, debtors and trade creditors is a very meaningful source of cash for Tesco. You can also see that it has been a trend in previous years. This mainly comes from the fact that sales have been growing and more supplies are on credit so creditors increase. Without it, Tesco’s cash flow performance would be a lot worse than it is. One question to ask here is: Is this source of cash sustainable if Tesco’s sales stop growing in the future. After all the adjustments have been made, Tesco produced £4.3bn of operating cash flow in 2014 compared with an operating profit of £2.6bn. However, look back a few years and it was generating nearly £6bn of operating cash flow back in 2010. What’s caused this big fall? The business is less profitable. Operating profit is £826m lower. Working capital cash inflow is £278m lower. Other cash operating cash flow items are £850m lower. You should find many of the reasons for these declines by reading Tesco’s annual reports. This section shows how much money a company is spending on its business and how it may be bringing in cash as well. It can do this by investing in new assets (known as capital expenditure or capex) or buying new business (acquisitions). Money can be raised by selling assets or businesses. You are also shown the money coming into the business from interest on bank accounts and dividends from investments in other companies. Any other cash flows from investing are in the “Other” row. Again, the size of the numbers involved here and their trend is what’s important. By far the biggest amount of money going out of the business is capex, although this number has come down in the last couple of years. You can also see that a lot of money has been coming in to the business from selling assets too (£6.8bn over the last five years). Retailers like Tesco have sold a lot of their supermarkets and agreed to rent them back from their new owners (known as a sale and leaseback transaction). This trend needs to be watched closely as frequent large sales of assets can be a sign of a business that needs cash as it cannot generate enough cash flow from trading (operating cash flow). More on this subject in the next chapter. For the last five years, investing cash flows have seen a net outflow from the business. This is not unusual but the scale of the outflows and their trends have to be watched. Tesco has £2.85bn of investing cash outflows in 2014. It needs to pay for that from somewhere. Again, more on this in the next chapter. This section shows how Tesco raises new money from lenders and shareholders and what it pays back to them. There’s often a lot going on here. You can see that Tesco has been raising a lot of new money from loans. Is this to fund investments or to repay maturing loans? Or is it just short of cash? We can see that lots of loans have been repaid during the last five years – £15.4bn in total. £10.7bn has been raised from new loans over the same period. Is this a sign that Tesco doesn’t need as much money as it did in the past? Perhaps it has decided to raise money from elsewhere such as selling its stores and renting them back. In fact, this has raised £6.8bn of cash during the last five years. Hopefully, what you are seeing here is how looking at the numbers gives you lots of questions to ask about a business. Finding the answers to these questions increases your understanding of a company and can help make you a better investor. Also pay attention to large amounts of money raised from issuing new shares. What is the trend in dividend and interest payments? Is the company buying back its own shares? We can also see that Tesco’s dividend has been costing it nearly £1.2bn a year. Can it afford to keep paying this? Interest payments should be compared with the interest charge in the income statement. If there is a big difference you need to find out why. It may be due to the timing of payments on a bond or interest being part of a cost of an asset and not being expensed separately. What’s interesting is that financing has been a source of cash outflow in recent years. This is something that needs to be watched and understood. If we add together operating, investing and financing cash flows, we get the overall change in the company’s cash balance. Tesco’s cash balance went up by £387m in 2014 and the preceding three sections told you how. To find out what this really means for Tesco, we need to get SharePad to analyse its cash flow in greater detail. You’ll see how it does this in the next chapter. At the beginning of this chapter, I mentioned that the cash flow statements of US companies look slightly different to those of UK companies. 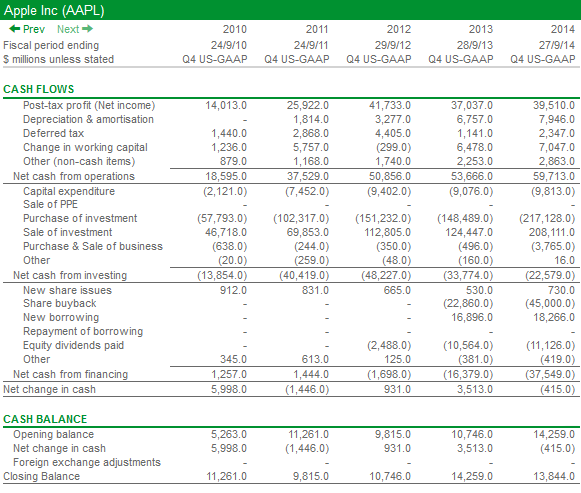 Below you can see a cash flow statement for Apple Inc taken from SharePad. The main difference between UK and US cash flow statements comes with how operating cash flow is calculated. In the UK, the calculation starts with operating profit and works its way down to operating cash flow. In the US, the calculation starts with post-tax profit (also known as net income). Most of the adjustments are similar with the exception of an adjustment for deferred tax (the difference between tax charged in the income statement and tax actually paid). The main difference is that the US figure for net cash flow from operating activities is stated after tax and interest payments have been taken away. The UK figure does not deduct interest payments. This leads to some slight differences when calculating and interpreting cash flow ratios which will be the subject of the next chapter. This article is for educational purposes only. It is not a recommendation to buy or sell shares or other investments. Do your own research before buying or selling any investment or seek professional financial advice. In part two of his investigation into RM, @RichardBeddard considers whether the supplier of educational resources and software services can sustain profitability and reignite growth. https://t.co/npUF7w1s6M #sharepad #sharescope #RM. If you would like to receive a notification when we release a new article, please enter your email address below. Chapter 8: Is this a good business?